Proper lighting is key for alertness, concentration, photography, and more. 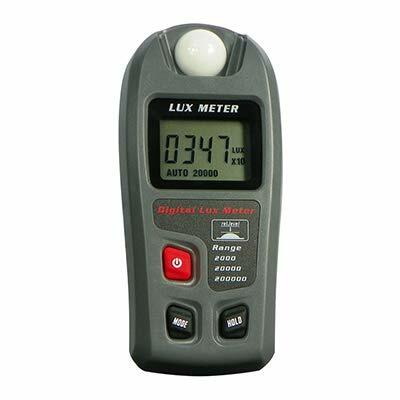 Don't just guess what the lighting is like find out first-hand with the Dr.meter Digital LED Lux Meter! 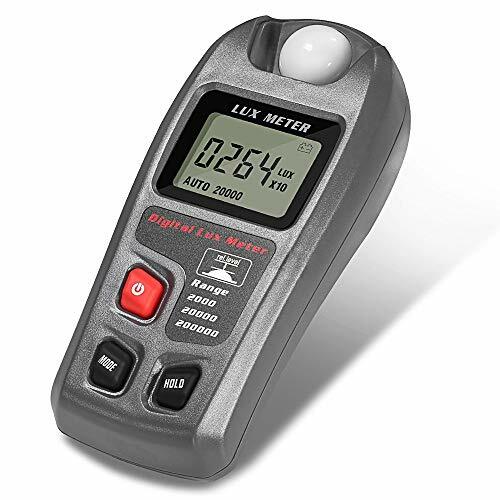 This digital light meter uses advanced detection technology to gauge the light level in a fraction of a second. 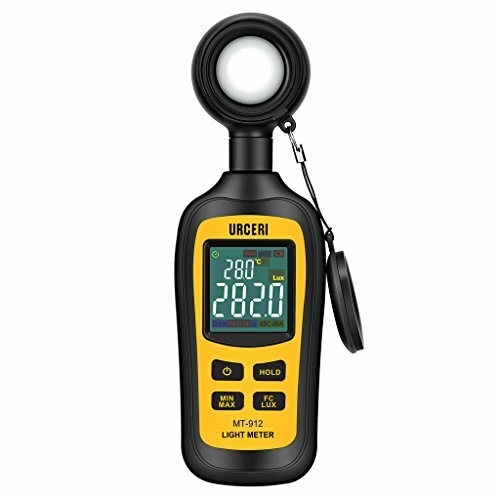 Use it to measure levels of fluorescent, metal halide, high pressure sodium, and incandescent light sources alike! It s quick, accurate, and a lifesaver when you re setting up your camera for the perfect shot. 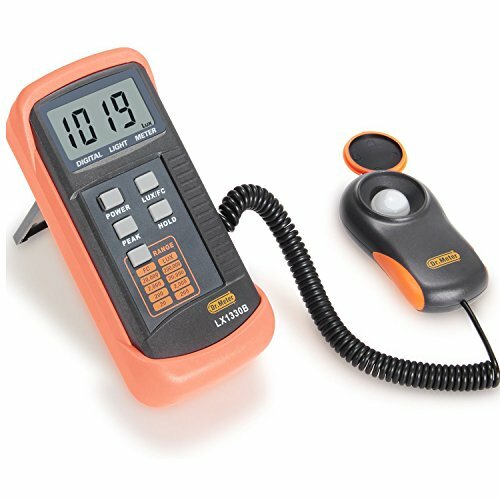 Easy and Intuitive: Using this digital LED light meter couldn t be easier. Just turn it on, point it at the light source, and check out the reading on the display screen. There are 4 adjustable measuring ranges (200lux, 2,000lux, 20,000lux, 200,000lux). Preprogrammed settings like auto power off, data hold, unit adjustment, and more do the hard work for you. LUMER POWER transforms your iOS device into a professional color and light meter. Lumu Power is the first light metering hardware which combines Color Temperature, Illuminance, Spot, Ambient and Flash Exposure metering functionality. iOS companion app is constantly improved and refined. Just download the free app and you are ready to go. 1. AMBIENT EXPOSURE - get perfect exposure every time. Control Balance between aperture and shutter time to achieve the right effect. 2. FLASH EXPOSURE - No more blind guessing. Simply measure flash and control balance between flash and ambient light . 3. COLOR TEMPERATURE - set the correct Color temperature in any light situation. White will be White and colors will be perfect. 4. CINE/VIDEO - 4 motion picture, ISO 850 as an option. 5. SPOT METERING - Use Lumu Light Meter app as a standalone spot meter, no additional hardware needed. 6. CHROMATOCITY - Currently only showing chromaticity coordinates in CIE 1931 color space, more will be added in the future app updates. 7. ILLUMINANCE - Whether you are a lighting engineer, an architect, a home-grower or just like to learn about light, the Illuminance mode is made for simple and exact reading of light in Lux of Fc. 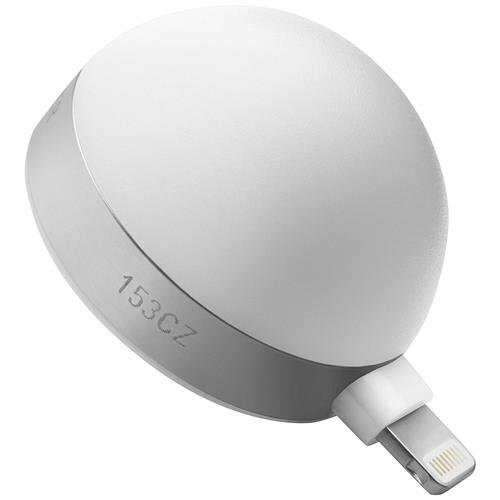 LUMU POWER transforms your iOS device into a professional light meter. Measure Color temperature, illuminance, spot, ambient and flash exposure. Just download the app and you are ready to go. You can find the User Manual listed in the Technical Specification tab in Product Information, located under the Product Description on this page. AMBIENT EXPOSURE - get perfect exposure every time. Control Balance between aperture and shutter time to achieve the right effect. FLASH EXPOSURE - No more blind guessing. Simply measure flash and control balance between flash and ambient light. COLOR TEMPERATURE - set the correct Color temperature in any light situation. White will be White and colors will be perfect. SPOT METERING - Use Lumu Light Meter app as a standalone spot meter, no additional hardware needed. 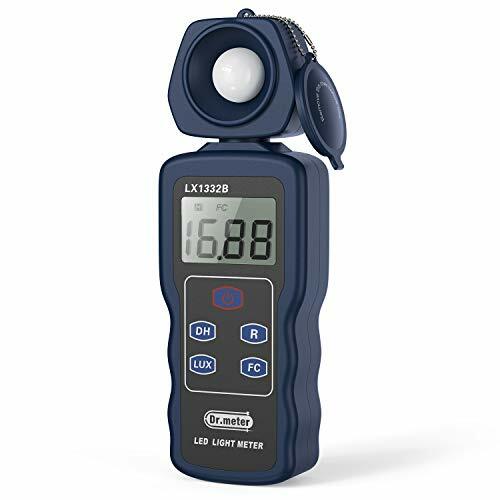 Brand: Lumulabs | Manufacturer: Lumulabs, Inc.
Over range indication:LCD displays "-OL-" or "-LO-"
High-precision design:The digital light meter will allow you to measure the lighting in an area, High Accuracy,fast response and stable reading. 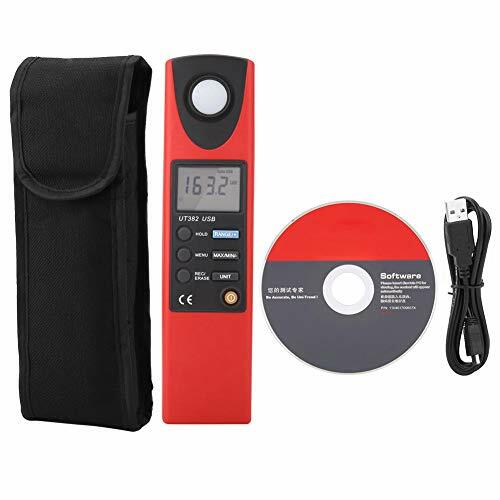 Dual Display: 4-bit color LCD display, easy to read the measurement, LUX/FC unit can switch freely select, data retention function, data automatically recorded. Portable Design:One-handed operation ergonomic design,This pocket size design makes it easy to carry, no matter where you are. Low battery indication: Built-in low battery level indication, enable / disable automatic shutdown, over range indication, low power consumption. 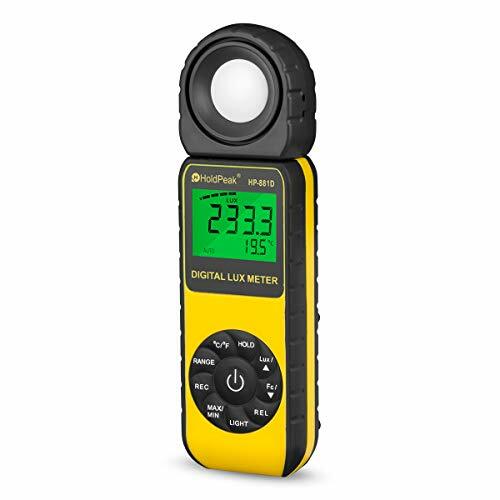 You only need one:Extensive use of digital photometer allows you to lighting in schools, offices, industry, warehouses, laboratories and other occasions. Luxi For All originated in a Kickstarter campaign in 2014. Following up on the success of our original Luxi models for iPhone 4/4S and iPhone 5/5s, Luxi For All brings light metering capabilities to the full line of iOS devices, as well as a majority of Android devices. Extrasensory Devices is a 100% Giving Company. The profits generated by sales of Luxi For All support charities that foster creativity in young people through photography, thereby helping underserved children tell their own stories. 100 Cameras - Empowers kids to express themselves and to change their communities through photography. The Pablove Foundation - Fights childhood cancer with love. 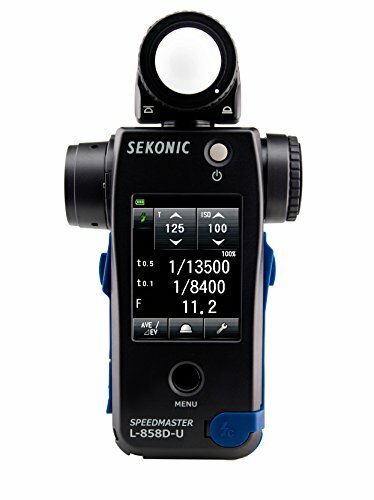 The Sekonic L-308X-U Flashmate Light Meter is a portable and versatile meter that offers dedicated functions for photography, cinematography and HD cinematography. 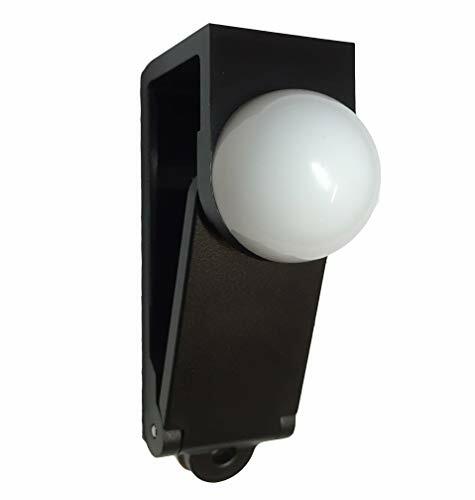 Featuring a sliding lumisphere, the meter can measure incident or reflected light via a lens with a 40 reception angle. The L-308X-U provides a wide metering range from 0 to 19.9 EV at ISO 100, works with exposure times starting as low as 1/8000 all the way up to 60 seconds, and offers a broad flash range from f/1.0 to f/90.9 at ISO 100. The meter s settings can be easily viewed on the customizable LCD display, which automatically lights up when working at 5 EV or darker. Photo mode allows for still shooting with aperture and shutter priority, Cine mode lets you select frame rates between 8-128 fps, and HD Cine mode is perfect for shooting with DSLR or mirrorless cameras. Additionally, PC sync terminal and a cordless flash measuring options are available. Powered by a single AA battery, the L-308X-U weighs approximately 3.5 oz. for convenient portability. Broad flash range from f/1.0 to f/90.9 at ISO 100, customizable backlit LCD display, Photo, Cine, and HD Cine Modes. Hti - Professional team on Amazon, which only deals with the development of the tools. 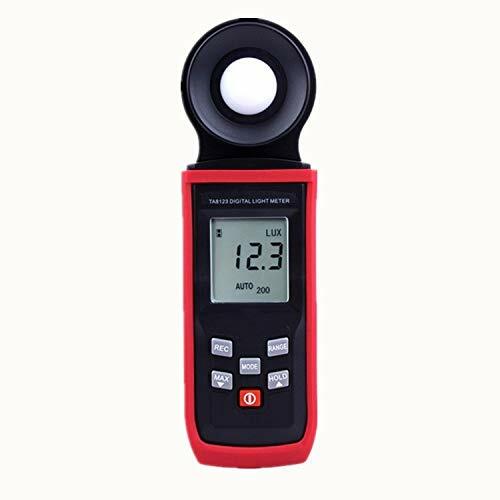 The HTI light Meter has a widely application in school, office, family, industry, warehouse, laboratory etc. if the measured value is overloaded, display in "OL", so that you can use the meter rightly and safely. With this function, you can the power-off battery timely. With this function, you can get the Max or Min measure data that you have measured. Auto Power Off after approx 15 minutes without any operation to have you save more battery energy. Please read the User Manual carefully and timely change the power-off batteries. HIGH ACCURACY AND MEASURE RANGE - measure range 0~ 200,000 Lux / 0 ~ 20,000 Fc; High Accuracy: 5%; Fast Measurement Speed: 2.5 times / second; with these features, the meter can ensure you a more accurate measurement application. BACKLIGHT LCD DISPLAY - the Backlight LCD display with LUX, FC, Min, Max ,Normal indication; MAX /MIN function, Low power detection, so that you can change the power-off battery timely; you can Auto Power Off: After approx 15 minutes to save more energy. AUTOMATION FUNCTION - Resolution can be 0.1 LUX / FC when the light reaches 200 LUX / FC; The incident cosine angle can automatically corrected; Data can automatically reset to zero when no signal input for your second use. 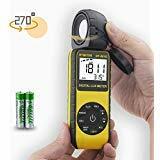 LIGHTWEIGHT AND COMPACT DESIGN - hand-held design and small size make the meter Lightweight, it is easy for you to carry it ; compact and ergonomics design makes the meter fits hand perfectly, providing a comfortable grip feeling. PACKAGE CONTENT - Light Meter, 9V Battery, Instruction Manual. - Please Note: It is HOLDPEAK brand, not generic light meter. 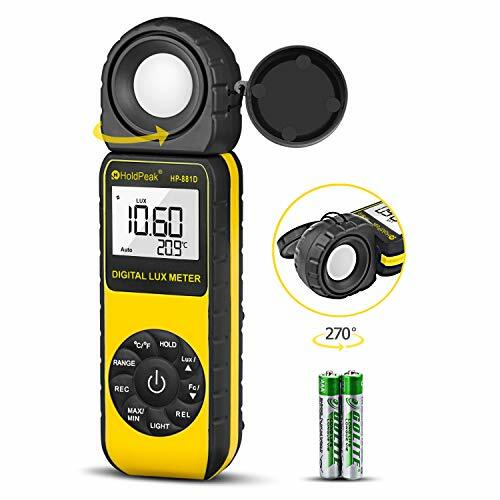 - The Digital Light meters are used in the general field of lighting, where they can help to reduce the amount of waste light used in the home, light pollution outdoors, and plant growing to ensure proper light levels. Resolution 0.1Lux / 0.01Fc ; Measurement speed: 2 times / second. 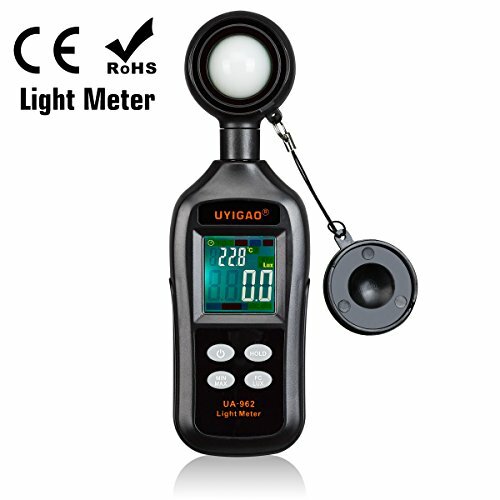 Wide Measure Range 0.1 - 400,000Lux/1 - 40,000FC,Light meter suit for plants,cinema,school,station,office and other place needed light testing. 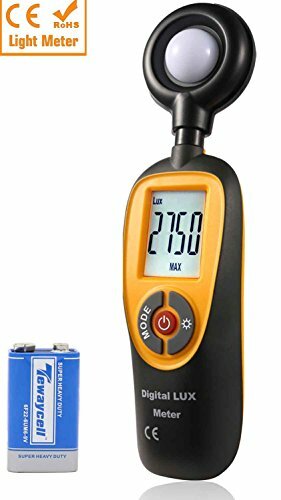 High Accuracy 4%rdg 0.5%f.s (less 10,000 Lux;1,000 FC) / 5%rdg 10dgt (over 10,000 Lux;1,000FC) with LCD back light.The lux meter sensor can rotate 270 degrees, So you don't need to move the lux meter,just need to rotate the lux meteer. Multifunction Rapid response, Auto Zeroing, Data Hold & Peak-Data hold switches, Low power consumption, Short rise and fall time,with LCD back light. Quality Assurance HOLDPEAK provide 1 year warranty and lifetime technical support.If there is any product issue, please feel free to contact us! 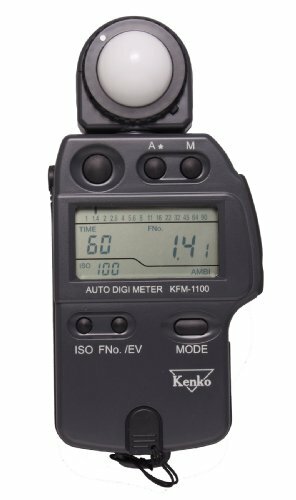 This is not a PRO photography light meter, after given the basic numbers, you'll need to do some maths to find your shutter speed and aperture. 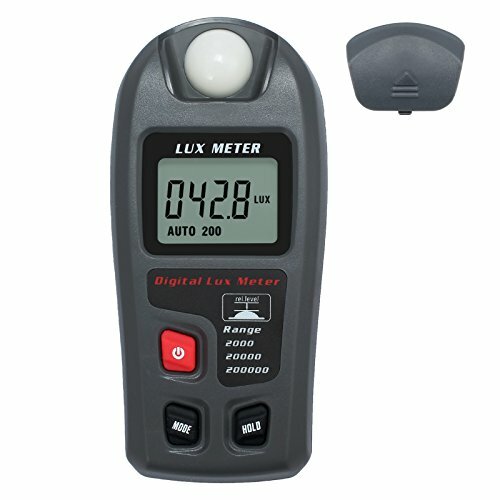 ORDER NOW Get this incredible BT-881D digital Lux meter Delivery in Just 3-5 Days! Small Size: It is light weight, compact, ergonomic, and user friendly. This pocket size design makes it easy to carry, no matter where you are. Widely Application: Extensive use of digital photometer allows you to lighting in schools, offices, industry, warehouses, laboratories and other occasions. 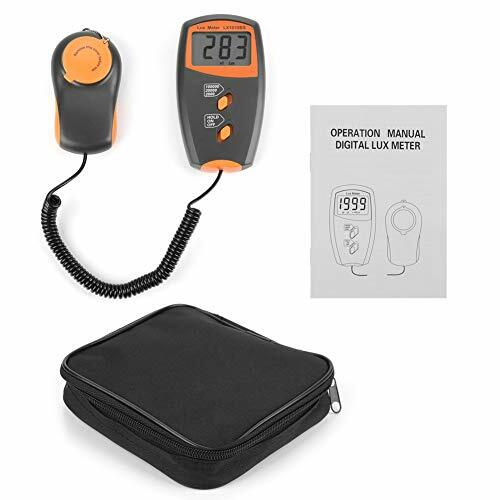 hand-held design and small size make the meter Lightweight, it is easy for you to carry it ; compact and ergonomics design makes the meter fits hand perfectly, providing a comfortable grip feeling. 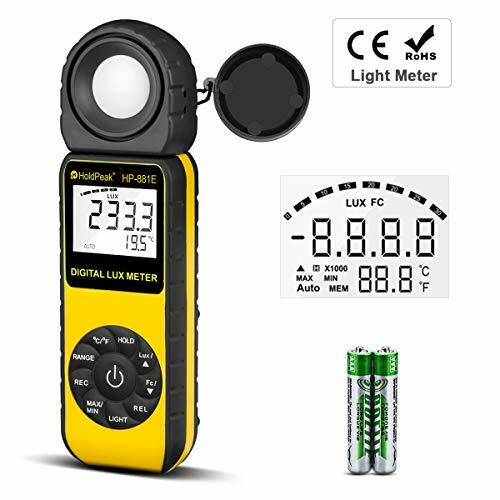 PROFESSIONAL TOOLS:This high precision light meter can measures luminosity from 0 to 200000Lux and ambient temperature and it has high accuracy of 3% rdg 10 dgts ( 10,000 Lux). Determine the proper exposure for a photograph. EASY AND CONVENIENT:Automatic and manual range conversion. LCD screen analog display, handheld design, lightweight and compact, easy to transport. WIDE RANGE OF APPLICATION:Use it for set design, factory, office, Greenhouse planting, cinema, library, stage and even home use. Dimensions: 185mm X 55mm X 30mm, Weight: 150g (batteries included).Package include: light meter, 2 AAA batteries and user manual. Any question contact with us,please. PROFESSIONAL TOOLS This high precision light meter can measures luminosity from 0 to 200000Lux and ambient temperature and it has high accuracy of 3% rdg 10 dgts (<10,000 Lux) and 4% rdg 10 dgts (>10,000 Lux). Determine the proper exposure for a photograph. EASY AND CONVENIENT Automatic and manual range conversion. LCD screen analog display, handheld design, lightweight and compact, easy to transport. WIDE RANGE OF APPLICATION Use it for set design, factory, office, Greenhouse planting, cinema, library, stage and even home use. 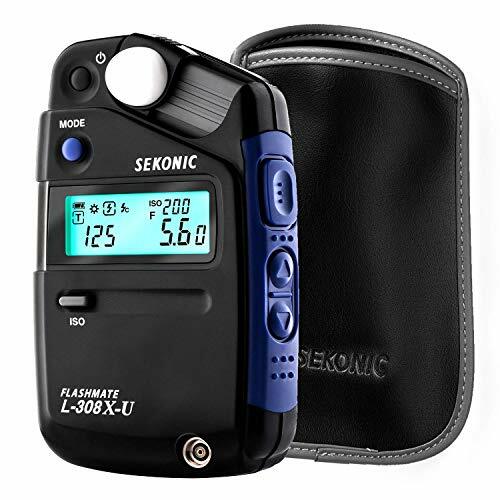 Dimensions:185mmX55mmX30mm,Weight:150g(batteries included).Package include: light meter, 2 AAA batteries and user manual. Any question contact with us,please. 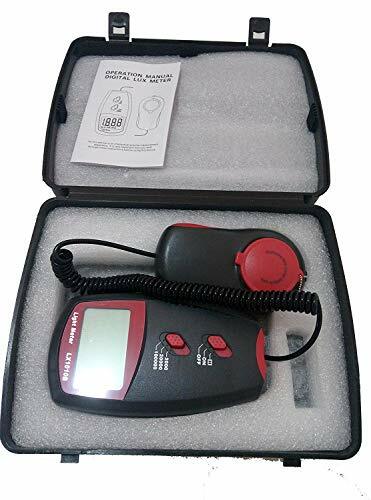 Digital Luxmeter, Digital Illuminance/Light Meter Handheld Actionometer Foot Candle Meter is widely use in school, office, family, industry, warehouse, laboratory etc. 1. Please make the measurement sensor vertically face the light source when you measure brightness. 2. You can select the measurement unit(Lux/Fc) by short pressing the "MODE"button for 1 second. 3. You can choose your needed measurement mode (Normal / Average / Max ), by long press the "MODE" button for 3 to 4 seconds. 4. You can hold the current measurement data by short pressing the "HODE" button for 1 second. 1.Don't place the unit in high temperature / humidity environment. Keep the surface of optical detector clean when in use, make sure the reference level is vertically facing the light source. 2.When the low battery icon appears on the display, replace the battery as soon as practical. 3.Please cover the protective cap and store the instrument in a stable, dust-free environment out of direct sunlight, when not in use for the life of meter. Measure Range: 0.1 ~ 200,000 Lux / 0.01 ~ 20,000 Fc. Operating Environment: 14 to 122 , 10% ~ 90%RH. High Accuracy: 4%; Fast Measurement Speed: 2 times / second. The Auto Measuring Range is 200 Lux, you can also select it. The Manual Range: 200 2000 20000 200000 Auto 200 (Lux). Measure Modes: Normal, Average and Max. LCD Reading, Hold the current measurement data. Low Power of Battery Detecting, Power Supply by one 9V Battery (Included). Auto Power Off: After approx 15 minutes. 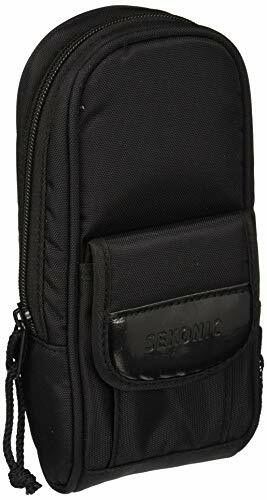 (1)Handheld design, light weight and compact, easy to carry. (2)Separate light sensor allows you to take measurements at an optimal position. (3)Data-hold function for holding the measuring value. (4)Low battery indicator tells you the low battery condition. (5)Wide range of application, use it for set design, factory, office or home use.